So far so good - my 1100cc bike had not been started for a year and the Westco fired it up first pull straight from the box without charging. Just what you expect from a premium battery! I am impressed. Great next day delivery from Tayna thank you. This is the second time you have given me top customer service. 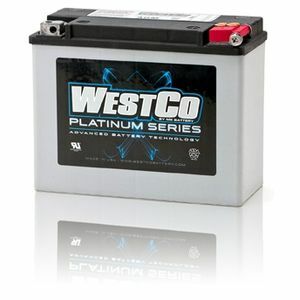 Purchased because of doubt that my previously bought motorbike battery from here was failing after 10 years. Ultimately found to be a fault with the alternator. But happy to have the new battery anyway, Passed the perfectly good old one on to a friend who is now using it on his bike. This battery is high end so it was expensive but looking back I wish I had got one of these earlier, I can tell the difference in the cranking current when cold starting. Well recommended. Battery seams fine, But it was packed up side down. Far better than lead acid battery I used before. Needed a great battery at a keen price, used tayna again as i was guaranteed both of these + the usual super quick delivery. The battery cannot be faulted....go on buy it!! Excellent service, delivery at correct time. I couldn't find any motorcycle part suppliers that could supply me with a sealed battery in this size (I'm fed up with checking fluid levels). Tanya came up trumps with more than one option and it was delivered in three days. Excellent service.